Savvy and modern, this wonderfully versatile style is ready-made for displaying your photo or artwork. This style is all about your image; it's the star of the show, so choose one that is super interesting and/or that tells a story. Also this great style allows you to choose a font, so you can make this style bold, delicate, sweet, funny, classic - what you want, you get! Or you can leave the solid color panels spaciously blank. Either way, you get to choose from 32 fabulous colors - carefree lights, sultry darks, radiant brights and trusty neutrals - to make your image look its best. With fresh fonts, clean lines and all those color options, Jules Veneer is a perfect all-purpose style that's super easy to personalize. Customize your Jules Veneer hanukkah tags today! 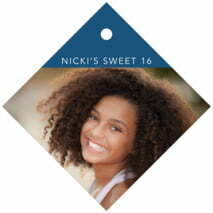 Jules Veneer Hanukkah tags are printed on extra-thick cover weight white paper and come in a variety of shapes and sizes (including square, circle, a scallop-edged circle, ovals, plus other more intricate shapes). They are printed on one side and are blank white on the back. You have the option to add text on the back for a small fee—just ask! Hanukkah tags come pre-punched with a small round hole to thread your choice of tying material. They are punched out individually and packaged as a set in small bags. Select a Jules Veneer Hanukkah tags shape and color above to get started!